Live Life Like a Best Seller: Hallow-what?! These were our "costumes" for our Halloween house party in Serbia last year. It may come as a surprise to some - since I LOVE dressing up and being absolutely ridiculous - but I really don't like Halloween. The "holiday" sort of just grosses me out and makes me all uneasy. Maybe it's because of my insane fear of horror movies, or perhaps my rejection of Halloween has something to do with the way my parents raised me. I have three little brothers, and we were more often dressed up as Noah and his arc full of animals than scary witches and bloody vampires. Most of our costumes were hand-made, compliments of my creative mother, and I only remember trick-or-treating once as a child. Do I think I missed out? Nope, I don't think I missed out at all. 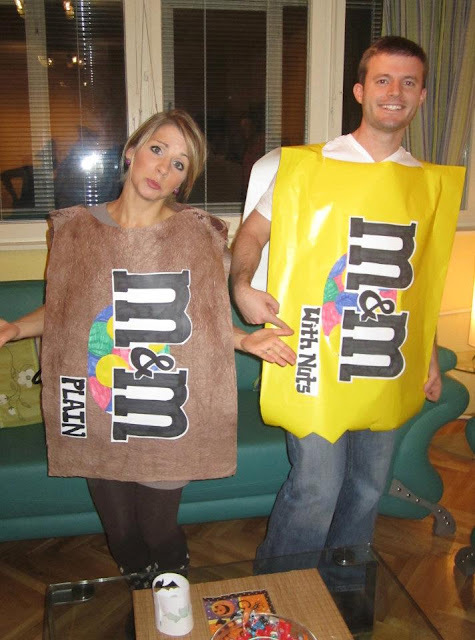 In fact, once Chris and I have kiddos, we may take them to harvest parties over neighborhood trick-or-treating. I have such fond memories of those church harvest parties. In any case, I love that Halloween hasn't become a huge commercialized holiday in Europe yet. People say that things in Belgium are starting to look more "Americanized" thanks to western movies and sitcoms. Classy Autumn decorations adorn the shopping street, and local chocolate shops offer leaf-shaped-truffles for sale, but I am yet to see a wizard hat or vampire mask for sale. In Belgium, October 31st is not a holiday, but November 1st (All Saints Day) is a national holiday and everyone has work and school off. In fact, most school children have been out of school for this entire week, and most adults will have November 1st and 2nd off of work. All Saints Day is a celebration of all Christian saints. There are different customs around the world, but in Belgium, people will bring flowers to the graves of the deceased. There is even customary bread that is sold in all the bakeries around Roeselare. The bread is baked into the shape of a horse and rider and it has some symbolic meaning for All Saints Day. While I love learning about the different customs in Belgium, I am most relieved that no scary monster will show up at my door tonight asking for candy. Be safe out there, and Happy Halloween All Saints Day. Nov 1st is the same in Serbia and people take flowers, etc and visit the grave sites of their loved ones, just like in Belgium. Of course we're not talking about Orthodox serbs, rather the Hungarian, Croatian, other multicultural serbs who are Catholic. The Big "Serbs" (Orthodox) have this holiday as well, but since they follow a strange calendar only Russia follows their dates are pushed and are later than the rest of Europe.